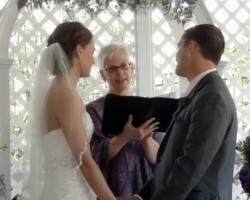 Journeys of the Heart is more than a single wedding officiant in Philadelphia, PA. This service is an entire team of ministers that each provide a different style of ceremony and bring their own personality to the process. Although they might all offer something different, each member of this team has been carefully chosen due to their professionalism, understanding and the quality of their ceremonies. You can guarantee when you choose Journeys of the Heart that you are getting the best in the state. When it comes to your wedding you shouldn’t put the ceremony in the hands of anyone but a true professional. Reverend Pamela L. Brehm has been officiating for couples in Philadelphia since 2001 and over the years has built up her experience and qualifications so she is able to provide the exact ceremony that each couple wants. 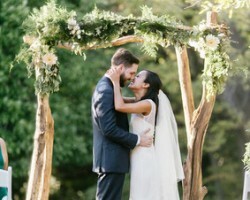 You will be able to work closely with this wedding minister to discuss the traditions and beliefs that you feel reflect you as a couple and Rev. Pamela will build these aspects into your ceremony. Once she was ordained by the United Church of Christ, Reverend Stephanie Anne Thompson started joining brides and grooms together in some of the most beautiful ceremonies in the state. Reviews of Rev. Stephanie and Heart Ceremonies always mention that every aspect of the service is completely personalized and that she really listens to what you want from your day and fully respects your wishes. 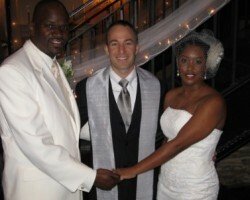 In addition to being one of the most flexible and understanding Philadelphia wedding officiants, Rev. Stephanie is also incredibly affordable. 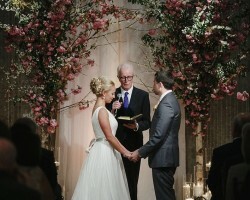 Charlie Cooper is the licensed officiant for Humbleman Weddings. He has performed a range of both traditional and non-traditional ceremonies that have included every aspect that you can imagine. Charlie believes in creating an environment where you will feel completely comfortable and one that you will be able to enjoy whilst you commit to the person that you love. The reviews of his services always mention Charlie is understanding and provides a beautiful ceremony every time he is asked to officiate. Donna Forsythe starting officiating in 2014 once Marriage Equality had been passed in Pennsylvania and since then has united many loving couples together with a beautiful Celebrant ceremony. As requests for her service have increased in number she ask three more Celebrants to join her and now Erika, Cely and Thomas are available to couples in Philadelphia and the surrounding area too. With such a dedicated team you are guaranteed to have a moving and beautiful ceremony, exactly as you deserve.